A profusion of small, waxy, pure-white flowers on purple-tinted stems appear in April amid finely cut, deep green leaves. 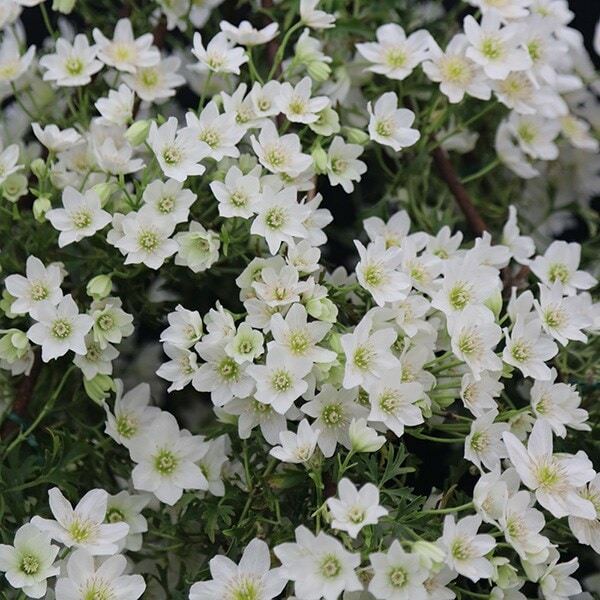 This dwarf, evergreen clematis requires a sunny site and protection against frosts. In all but the warmest areas of the country it's best grown in a conservatory or cool greenhouse in a large patio pot. Garden care: No routine pruning is necessary. If the spread of the plant needs to be restricted prune immediately after flowering, cutting back overlong shoots to healthy buds. Apply a slow-release balanced fertiliser and a mulch of well-rotted garden compost around the base of the plant in early spring. Hello, The growth rate is largely determined by external factors, such as the available water, light and nutrients the plant receives, but as a very general guide, I would say that as it is a reasonably fast grower, it will reach maximum height in around 3 years.